How to grow bell peppers, or sweet peppers in home vegetable gardens. 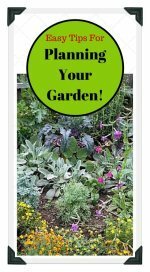 Easy tips for planting, growing, caring for, watering and fertilizing pepper plants for successful vegetable gardening. As you learn how to plant bell peppers, you will be amazed at their beauty, longevity, and varied use in cooking. Most bell peppers are sweet but some hot varieties exist. American peppers are members of the tobacco family, which includes eggplant, tomatoes, and potatoes. Sweet peppers are used raw, cooked, or pickled. California Wonder is ready for harvest in 75 days. The 4 inch long, 3 ½ inch wide bell pepper is perfectly sized for stuffing. Fruits are deep green as they develop and turn brilliant red when ripe. Red Beauty Hybrid reaches maturity in 68 days and begins to redden a couple of weeks later. The fruit is thick-walled and stores in the refrigerator for an extended time. The Yellow Monster variety produces colossal sweet peppers that mature to a brilliant yellow color. Fruits are over 7 inches long and 4 inches wide. This type is a heavy producer all season. The Giant Marconi Hybrid is an All American Selections winner. 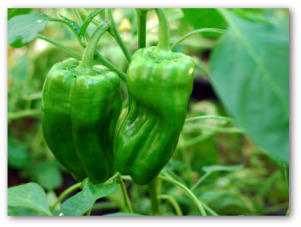 The robust plants grow to 30 inches high and produce 8 inch long bell peppers! Harvests in 72 days. This huge and tasty bell pepper is adaptable to all sorts of growing conditions. The Horizon is a sweet orange bell pepper variety. The blocky bell is 4 inches in diameter and 4 inches long. The strong plants are resistant to bending from the weight of the fruits. • Bell pepper seed germinates in ten days to two weeks. • Peppers grown from transplants reach maturity in 60- 80 days. • When growing sweet peppers, leave a space between rows of up to 3 feet. • Leave a space between pepper plants of 2 feet. 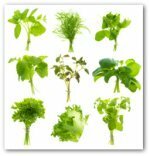 • Plants are very tender and easily damaged by frost. 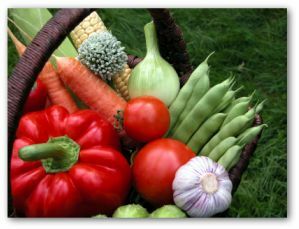 • For a sufficient harvest, plant as many as five plants per household member, if vegetable gardening area allows. • Major pests are aphids, frog-eye leaf spot, caterpillars, and the pepper weevil. Water pepper plants at the base of the plant if possible. Overhead watering pepper plants during blooming can wash away plant pollen which will reduce or eliminate fruit production. Use a drip system for watering if possible. Add low nitrogen fertilizer as needed for fruit production. Fertilize every 2-3 weeks during early growth, and every 3-4 weeks as plant matures. Use mulch to conserve water in your garden, but do not cover plant base with mulch. 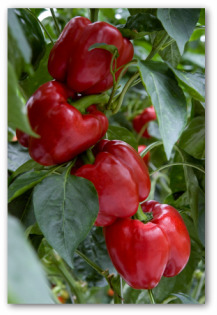 Bell peppers are typically harvested in the green stage.If you desire red sweet peppers, leave the produce on the plant until fully ripened.To harvest, snip the peppers off at the vine instead of pulling to prevent any other part of the plant being pulled away along with the pepper. Green, red, yellow, chartreuse, or pimento colored, bell peppers are great for, canning as well as pickling and preserving, either by themselves or in combination with other tasty ingredients in relishes and mixed pickles. Ideally, you want your soil to be an equal balance of clay, sand, and organic matter when growing bell peppers and other garden vegetables.You can determine the nature of your garden site and enjoy a trip back to your childhood by performing a simple experiment.Dig down into the ground at least a foot and fill about a third of a clear bottle with soil. Pour in another third of water and give the container a good shake before leaving it to settle.The heavier sand will sink to the bottom quickly and the organic matter will flow to the top.Finer sands and clay takes much longer to settle. Check the bottle a few hours later and you will get a good idea what makes up your soil.Act accordingly to correct the balance if necessary.